John Powers, Daniel Santola, Patrick Higgins, Laura Jordan and Professor Michael Hutter have been consistently listed in the legal profession’s oldest and most-respected peer-review publication. We are honored that our peers continue to recognize that our commitment to excellence makes such a difference in our client’s lives. 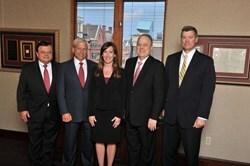 Powers & Santola, LLP., one of the nation’s preeminent medical malpractice and personal injury law firms, is pleased to announce that five of its attorneys have again been named to the 2014 Edition of Best Lawyers in America®. Powers & Santola limits its practice to representing a select number of people who have been catastrophically injured by medical and hospital malpractice; the failure to timely diagnose cancer; and the failure to provide adequate protection to construction workers. John Powers and Daniel Santola, the firm’s founding partners, were both selected by their peers in the fields of Plaintiff’s Medical Malpractice Law, Plaintiff’s Personal Injury Litigation and Plaintiff’s Product Liability Litigation. A former President of both the New York State Academy of Trial Lawyers and the New York State Trial Lawyers Association, this is the thirtieth consecutive year that John Powers has been selected as one of the “Best Lawyers in America®“. The author of Litigating Construction Accident Cases in New York, and a co-author of Construction Site Personal Injury Litigation, Dan Santola is widely recognized as a preeminent authority on New York’s unique laws that protect workers in the hazardous construction industry. Senior partners, Patrick Higgins and Laura Jordan, were also selected in the areas of Plaintiff’s Medical Malpractice Law and Plaintiff’s Personal Injury Litigation. Patrick Higgins is Editor-in-Chief and contributing author of The Plaintiff’s Personal Injury Action in New York and author of Representing the Personal Injury Plaintiff in New York. Laura Jordan was recently awarded the 2013 Albany Law School “Young Alumni Award”, which recognizes someone whose career exemplifies the highest standard of professionalism, personal integrity, compassion, and advocacy for the legal profession. Michael Hutter, Jr., a Professor at Albany Law School, who serves as Special Counsel to Powers & Santola, has been named in the field of Appellate Practice. Professor Hutter currently serves as the President of the Albany County Bar Association and is the author of a column on Evidence in the New York Law Journal. In addition to its lawyers being individually honored, the firm of Powers & Santola has repeatedly been recognized as one of the nation’s “Best Law Firms” by U.S. News World Report and Best Lawyers. The firm has consistently been awarded a tier one ranking in both the areas of Plaintiff’s Medical Malpractice Law and Plaintiff’s Personal Injury Litigation for the Albany, NY metropolitan area. Since it was first published in 1983, Best Lawyers® has become universally regarded as the definitive guide to legal excellence. Because Best Lawyers is based on an exhaustive peer-review survey in which almost 50,000 leading attorneys cast nearly five million votes on the legal abilities of other lawyers in their practice areas, and because lawyers are not required or allowed to pay a fee to be listed, inclusion in Best Lawyers is considered a singular honor. Corporate Counsel magazine has called Best Lawyers the most respected referral list of attorneys in practice.